This blog was originally posted on the REEEC blog on March 12, 2014. On March 1, several graduate students affiliated with the Russian, East European, Eurasian Center, including myself, participated in GlobalFest 2014 in Normal, Illinois. 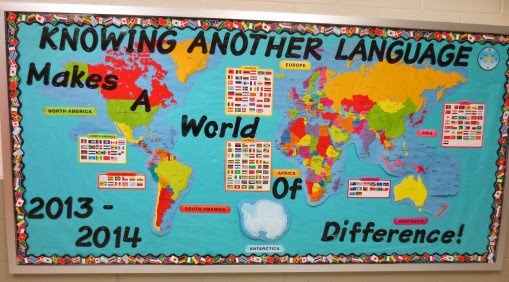 This is an annual event that celebrates world languages and cultures, and encourages middle and high school students to make connections with the global society. It was amazing to see such a large group of young people take an interest in the world beyond their classroom walls. Several languages and cultures were represented, and of course, we did our part to teach kids about Russia and Eastern Europe. Natalya Khokholova and Devon Lechtenberg taught Russian and Polish language classes, respectively. Each of them taught four sessions of about 20 minutes each, covering basics like the alphabet, some pronunciation, and greetings. They were also able to talk about the countries and their cultures. For example, Natalya discussed the Sochi Olympics with her groups of students. Undoubtedly, the most popular event REEEC offers at GlobalFest is Russian Horror Stories. Stephanie Chung, with the help of Zsuzsanna Magdo, introduced Russian Horror Stories to 70 students; it was standing room only in the small classroom! Stephanie read “Baba Yaga and the Runt” from Sibelan Forrester’s translation of Baba Yaga: the Wild Witch of the East in Russian Fairy Tales, available in REEEC’s Multimedia library. Students discussed their favorite horror stories and films, and then compared the main elements from them with common themes found in Slavic horror stories. Stephanie introduced several common characters in Slavic folk literature, including the most famous of all, Baba Yaga. A new addition to GlobalFest this year was the board game Kolejka or Queue. Poland’s Institute of National Remembrance developed the game to teach players what life was like under a centrally planned economy during socialism. Zsuzsanna introduced the game by comparing it to the origins of the game Monopoly, which was not originally intended to give capitalism a glamorous name. We had three games set up for a total of 15 players. The students were very patient, as the game is quite complicated. In Kolejka, each player has a shopping list they must complete in order to win the game. It is not possible, however, to just go to the store and buy everything at once. Each player’s five pawns stands in different lines, not knowing whether there will even be a delivery that day. Shortages were quite common in 1980s Eastern Europe, including Poland. Hence, it was possible to stand in line for hours and not be able to buy anything, the store having run out of items several people before you in line. In the game, players can jump the lines and switch places according to a number of action cards. These range from snitching on a neighbor to the police and throwing them out of line, or borrowing someone’s baby to skip the line completely and be able to buy what is in the store first. Zsuzsanna and I stood close to answer any questions, and there were definitely many questions! At first, the students did not like the idea of sabotaging their friends in order to get ahead in line, but they quickly learned that it was the only way to get all the items on their shopping lists. Another foreign idea that took some getting used to was dealing in the black market. In Poland, people might buy things they did not actually need at the time only to use them to trade in the black market for things that they did need. 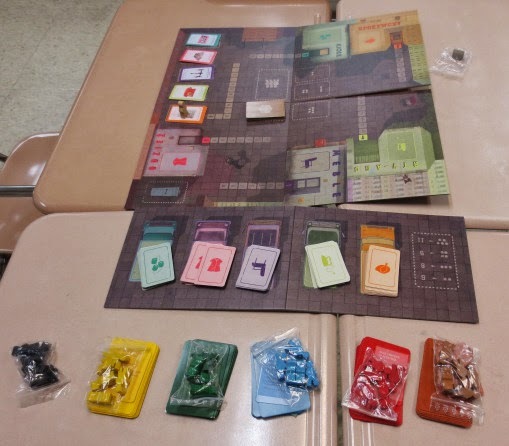 The game represents this practice very well, since the black market is always stocked, while the stores receive irregular shipments of goods that might not fit in your list. Overall, the students seemed to enjoy the game and their trip to 1980s Poland. 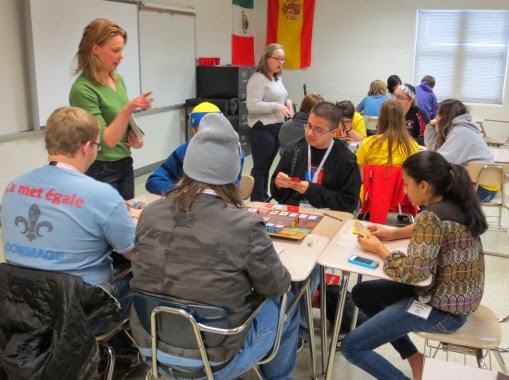 By participating in the sessions REEEC organized, along with the rest of GlobalFest, students were able to experience a host of different cultures and languages. They were open to new experiences and gave insight to our own perspectives on the world. Urszula (Ula) Biegaj Lechtenberg is a second-year Master’s student at the Graduate School of Library and Information Science. She graduated with a REEEC MA in 2012. Her interests include Slavic librarianship, academic libraries, and instruction. She works as a Graduate Assistant in the cataloging department at the Library, and holds an hourly position at the Slavic Reference Service.